Bliss: Chef Jay's ...cookies for breakfast! I had the opportunity to review Chef Jay's Tri-O-Plex Snacks (all opinions are strictly my own, the only thing I received from Chef Jay's company was the samples). Chef Jay has devoted his life to creating extremely healthy (and not to forget-delicious) bars, cookies and brownies. His company sells a wide variety of products, but I had the opportunity to sample his Tri-O-Plex protein cookies. I thoroughly enjoyed warming these in the microwave for about 10 seconds for a hot out of the oven taste! They were also amazing crumbled up over a bowl of ice cream. 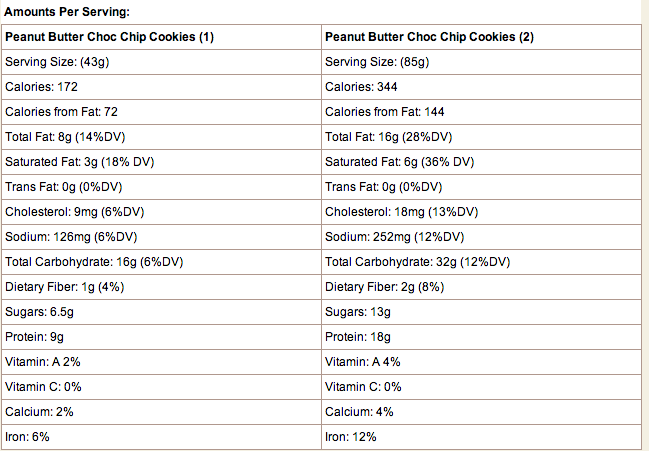 The nutrition is pretty darn good for a cookie! The saturated fat is a little high for me... but there are cookies. I was ecstatic with the protein content and iron though! CJ PROTEIN BLEND (SOY PROTEIN ISOLATE, WHEY PROTEIN ISOLATE), CHOCOLATE CHIPS (SUGAR, COCOA BUTTER, SOY LECITHIN, NATURAL FLAVORS), SUGAR, HONEY, PEANUT BUTTER (DRY ROASTED PEANUTS, DEXTROSE, HYDROGENATED COTTONSEED, RAPESEED OIL, AND SALT), PEANUTS, WATER, UNSALTED BUTTER, WHITE WHEAT FLOUR, BROWN SUGAR, NATURAL PEANUT FLAVOR, EGGS, PEANUT FLOUR, VANILLA EXTRACT, BAKING SODA, SALT, POTASSIUM SORBATE. Not too bad... I wasn't "excited" about the hydrogenated oils in there, but I suppose a little bit of anything never hurt anyone right? Overall: Delicious taste! Great protein content! However, they should still be treated as what they are: a treat. They are still cookies, and while they are a great protein supplement for those consumers needing a protein boost, they are cookies-and to be treated as such.